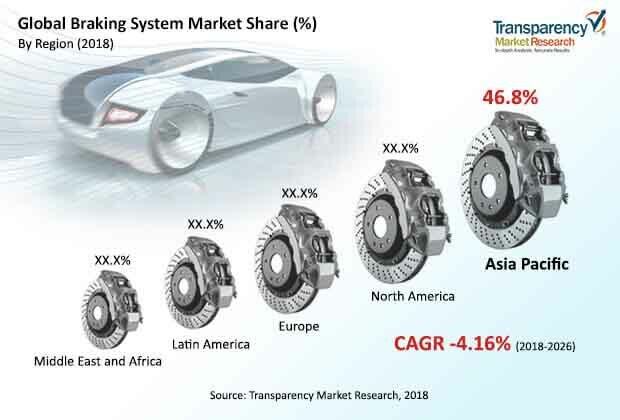 Transparency Market Research has published a new report titled, “Automotive Braking System Market - Global Industry Analysis, Size, Share, Growth, Trends, and Forecast, 2018 – 2026”. According to the report, the global automotive braking system market for automotive is anticipated to surpass US$ 107 Bn by 2026, expanding at a CAGR of more than 4% during the forecast period. Rise in demand for safety without compromising on speed drives the global automotive braking system market. Increase in the number of young consumers who prefer high speed vehicles influences technological development in automotive braking system. Government safety regulations standardizing vehicle stopping distance and advancement in braking technologies drives the global automotive braking system market. Increase in demand for SUVs and crossover vehicles requiring high performance boosts the need for automotive braking system. High demand for SUVs for off-terrain activities is increasing demand for the development of automotive braking system in North America. The Trump Government’s investment in infrastructure and improvement in logistics in the U.S. are increasing demand for commercial vehicle in the country. Demand for pneumatic automotive braking systems in heavy commercial vehicles and buses & coaches can be attributed to better brake response and high efficiency. Low production cost and high demand in China and India drives vehicle productions in Asia Pacific. Entry of foreign automakers and auto parts manufacturer in the region to cater the growing demand is expected to boost the automotive braking system market in the region. BRICS participation in trade affairs drive the automotive market in India and China. This is improving transport logistics and fueling demand of commercial vehicles. Hydraulic automotive braking systems are extensively used in Asia Pacific. Advancement in technology and rise in consumer awareness regarding air brake operations are projected to drive the pneumatic automotive braking system segment in the region. North America and Europe are leading markets for pneumatic automotive braking systems. Competitive dynamics of the trucking industry and rigid safety norms are driving the pneumatic automotive braking system segment in North America. Disc brakes have shorter stopping distance and are more efficient in emergency braking. Lack of external casing in these brakes allows cooler running. Aftersales servicing is much simpler and faster for disc brakes, and thus these are preferred in passenger vehicles. Shift from rear drum brakes to rear disc brakes in low segment vehicles in Asia Pacific and Latin America is estimated to drive the disc brake segment. Many heavy duty trucks have disc brakes. This is anticipated to boosts the disc brake segment of the automotive braking system market. Brakes are extensively used and undergo wear and tear, which can compromise occupant safety; therefore, the aftermarket segment of the automotive braking system is likely to expand at a considerable pace. Rise in consumer awareness regarding periodic maintenance and entry of OEMs in aftermarket channels boost the aftermarket segment of the automotive braking systems market. Key players operating in the global automotive braking system marker are ZF Friedrichshafen AG, Akebono Brake Industry Co., Ltd., Brembo S.p.A, Continental AG, Robert Bosch GmbH, AISIN SEIKI, Borg Warner, WABCO, Hyundai Mobis, Hitachi Ltd., FTE Automotive, Futitsu Ten Ltd., Nissin Kogya Co., Ltd., Brakes India, Federal Mogul LLC., Haldex Group, Hella Pagid GmbH, Sumitomo Riko Company Ltd., Hutchinson SA, Nisshinbo Brake Inc., TMD Friction Holdings GmbH, MAT Holdings, Inc., ASK Automotive Pvt. Ltd., BNA Automotive India Pvt. Ltd., AC Delco, Meritor, Inc., Mando Corporation, Knorr Bremse AG, ADVICS CO., LTD., and EXEDY Corporation.